Anyone who's watched Tim Dolan long enough has likely come to figure out that, while maintaining a perception of omnipresence, the cardinal-chief of the Stateside bench usually tends to make his public interventions in highly concentrated bursts. 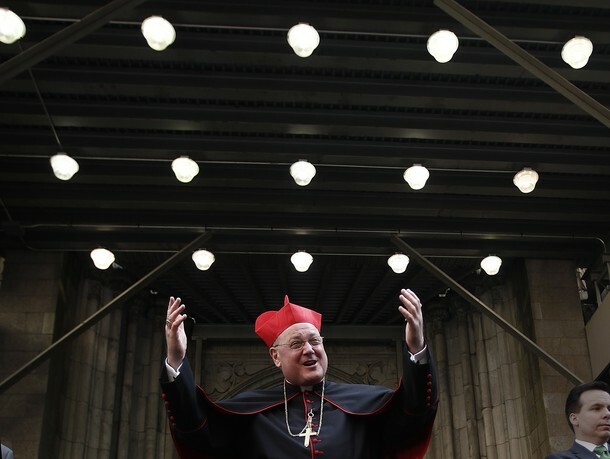 On a related note, almost three months since B16 "put the red hat on the Empire State Building" (or the still-rising 1 World Trade), Dolan's Homecoming Tour -- with its closed streets and giddy throngs, perhaps the closest thing to a Papal Visit American Catholicism will experience for quite some time -- reached its close on Sunday in his native St Louis as the city's 2,700-seat Cathedral-Basilica overflowed, much like it did on Assumption Day 2001 for his ordination as a bishop. The Mass was the new cardinal's second Midwestern stop in a week, following a swing through his prior charge in Milwaukee, where the event dominated local news for days and the congregation began queueing up before dawn for a seat in the 2,000-seat basilica dedicated to Our Lady Help of Christians atop the Beer City's Holy Hill.